I like me some old black and white horror. I really do. 1951 gave us The Thing from Another World. A classic movie about finding a crashed space ship in the Antarctic ice. They also find a pilot. The ‘thing’ they find turns out to be some sort of man-shaped beast that wants to kill every one. No real reason why. The manage to grow some new plants that breathe and destroy them with electricity. Well, guess how the kill the man-sized ‘thing’? No real surprise ending, most of the crew makes it back home safely. Wait? What? If everyone lives and they had this alien craft… but but but! Thankfully this movie died a timely death and it wasn’t until 1982 that anyone really gave it much of a thought. Well, I’m sure John Carpenter did. I’m sure he must have seen the Blob as well (see yesterday’s reviews). Only he took it a few steps further. Rather than a plant from space or even a lump of digestive jelly, he made a creature that could take on the shape of anything it touches. The movie starts with a helicopter chasing a dog. Norwegians shooting and trying to kill this dog. Why? Why would they kill this dog? Stop trying to shoot the nice animal. Oh! It’s a monster. The Crew only figures this out after visiting the Norwegian camp (no radio contact?) and find it mostly burned to the ground with oddly shaped masses burned and unrecognizable. They find the map to the space ship, see the block of ice it’d been frozen in, and all that. Back at camp this things starts to kill people off slowly. Okay, not that slowly. It’s pretty efficient at mimicking and killing. Doesn’t some really cool transformations as well. Of course, in the end, the last two remaining crew drink a bottle as they watch the camp burn. Wait, is that it? NO! 2011 brought us a PREQUEL! This isn’t often done and to be honest I was a little excited. Sure the cast was mostly nobodies (okay, no names I can recall at all) but regardless, it was a prequel to John Carpenter’s The Thing! What could possibly go wrong. Well, first of all you know going into the movie (if you saw the 1982 movie) that everybody dies. So the only real suspense is when. I think the best part of this movie was they were farily true to the 1982 version. The block of ice the thing smashes out of (leaving it looking like the 1982 version). The burned, melted mass (looking like the 1982 version) and the helicopter at the end shooting at the dog running away. They did a good job. I have no real complaints except that I kinda knew what to expect going in so there was no suspense and I wasn’t caught by an BOO! Moments in the movie. I hate BOO moments not because they scare me, but because they’re an over used trope. At least they didn’t put a cat in the camp. I probably would have stopped watching if they’d done that. All in all the 1982 Thing is my favorite of the three by far. Yes, it has BOO moments, but it doesn’t rely on those to get the point across that this thing is scary and will kill you. Just like Alien, it’s a horror movie in the best possible sense. Maybe I should write my own sequel to the Thing. Hmmm… yeah, right after I write my Blob sequel. Maybe I’m getting overly cynical in my old age. Maybe I’ve come to expect more from Hollywood than just a good concept. Maybe I don’t think Hollywood gives its audience any credit for being able to spot plot holes in movies and question where the writer was when making certain decisions. 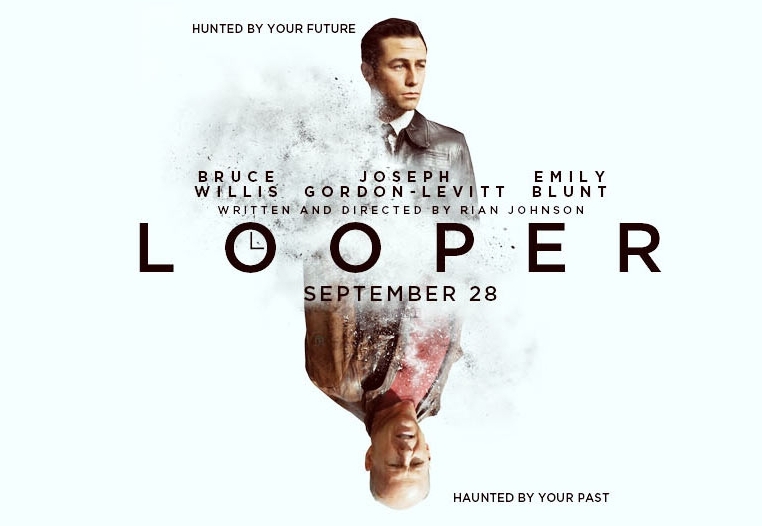 Looper is a movie about a time travel. In one aspect. It’s only one way travel. I was fine with that. Loopers are paid assassins (in our future) that kill people sent from far into the future. Their job is to kill and dispose of corpses. Attached to the ‘hit’ is their pay. Okay, I’m fine with that. Works for me. Loopers are eventually ‘retired’ and this is called ‘closing the loop’. Eventually their future self is sent back and they must kill their future self. I was also fine with this. They get a golden payday. All is good. Our protagonist says “Most loopers aren’t forward thinkers.” This means that most of these loopers are dullards that figure there’s no way out for them and accept their fate. Partying, doing drugs, etc. I’m still on board. So far it was a good ride. There are even TKs in this future the loopers live in. People with telekinetic ability. Wonderful. I’m 100% into this movie at this point. One of the loopers fails to close his loop. He lets the guy get away. “Letting your loop run.” This is a very bad thing. All sorts of things can go wrong. At this point I’m still on board. The looper boss (a guy sent back from the future that set all this up) has this loop closed the hard way. Basically by kill both the present and future person. Not a pretty sight. Then our protagonist is supposed to close his loop. In one scene he sees himself failing, but then succeeds, but he knows how to get away. It’s like a future flashback. Very cool the way they did this. I got it. It was creepy. It made a weird sort of sense. Even now I still get chills thinking about this concept. The future version starts to see how things are changing. He experiences the memories because now things are changing. His goal is to save not only his life, but the life of his wife who he’d seen killed. Brilliant! There’s some maniac in the future that’s screwing everything up and closing all the loops. Present protag needs to kill future protag. The ‘boss’ is after both of them because as we know, letting the loop run is a bad thing. Awesome! The future self somehow got knowledge of where this future bad guy came from. He knows the birthdate and hospital. He’s going to save the future by killing this kid. This little flashback is weird. I kind of got it, but it felt like it came out of the blue. I was still okay. Future protag was remembering things present protag was doing and was able to avoid him and beat him. I was still okay. Future protag could see the effects of his actions on the future and take steps to make sure things went the way he wanted. This was getting a little twisted, but I figured things would work out. Let’s see where this goes. Present protag ends up with one of the addresses of the kids that future protag is out to kill. By coincidence he ends up on the farm where the one kid future protag needs to kill to save the future. He likes the mom and the kids seems alright, so he’s out to protect them. Meanwhile future protag doesn’t see any of this and has no memory even though he could remember everything else that had happened to future protag. <sigh>. So he kills one kid. Then the second kid is the son of present protag’s girlfriend. Kills that one as well even though present protag is with the one kid that needs to be killed. Well, I guess it’s better to be safe than sorry and just kill them all off, eh? Of course we get to the paradoxical climax. Future protag is kills the girl and misses the kid. Present protag is too far away to do anything. Even though he’s been able to make corrections because of this loop that creates the future bad guys, he sees only one way to close this loop. Rather than know what he’s going to cause happen, he kills himself. Okay, seriously? This guy was a forward thinker. He was able to change his present and future multiple times by seeing the result of his actions. But in the end when all is known, he kills himself? Why? He knows all he needs to do is kick the drug habit, not lead the life future self led, and presto, all is fixed. Perhaps he can even prevent being caught and brought back to the past. There are so many other options than killing himself. I was on board with this movie right up until the end. I found the ending weak and lacking imagination. It felt like an easy way out from having to explain anything. It left me with the big question of why, if future protag can see how the action play out and remembers everything and present protag can make changes to the timeline was killing himself the ONLY option? Now I understand that we don’t want another Groundhog Day type of movie (that was brilliant in its own right) but this all could have been accomplished better with multiple loops of trying to solve the riddle. Much like the original Time Machine where the time travelers keeps going back in time to save his fiancée only to realize that there’s no way to change the past once its written and the futility of his efforts lead him to other discoveries. Present protag could have done more or seen that no matter what he did, death was the only solution. How did he know that by killing himself the kid still wouldn’t grow up to be a monster in the future? We didn’t see that option play out or any other option. Why did future protag not see what was happening and realize? The end was a mash of the end scene playing out once. Mom dies, kid rides off on a train and becomes the future bad guy. The memory loop would have impacted future protag just like it affected present protag. He could have ended the loop right there, but present protag saw it all play out when future protag was the one who would have seen the effects of his actions and been able to stop it. Not present protag. I sighed. I mumbled. I groaned. I was happy with the movie right up until the ending. This movie could have ended a thousand different ways. They picked one of the ways that, in the end, I felt cheated. However, I will watch this movie again. Perhaps more than once. Twelve Monkeys had a similar loop just like this movie, but that one the present protag had no idea it was future protag that died and could do nothing to change the course of events. He could only realize at the last moment as he died what all the events meant and how they played out. I love me some time travel. I’ll give this one a second chance. Perhaps there’s something I missed. Perhaps I’m being too cynical. Perhaps I just need to detach my brain when I watch a movie. There is a lot of good in the movie, I just wish it had ended differently. Not a strong finish to a strong movie. Hey, you know that Steve McQueen guy. He’s the one that was made famous by the Blob! That movie must have made him millions over the years. Right? Odd fact, he made $3000 for that flick. He had a choice of contracts. Get $3000 up front or get a piece of the action. He was broke and really needed the money and $3000 looked like a lot for a film that would likely be just another 1950s monster movie. So he took the money and figured that’d be the end of it. If only he would have had Robert Downey’s foresight to take a cut of the profits. So I haven’t seen this movie in years. I mean a very long time. Perhaps better than 10 years, but I honestly don’t recall the last time I watched it. I know I had seen the remake far more recently. I know there is also a Blob II (the return of the blob, Beware! 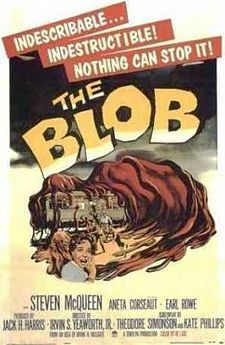 The blob, the film the J.R. shot, and other titles) but I have never seen that one. Being that it was shot by Larry Hagman I feel that at some point I need to watch it. As a Viewer: This movie spends a good deal of time letting us get to know our main characters. It’s a good slow build up and we get the police involved with our main characters before anything of import happens during the evening while the kids are out. The kids just take an old man to the doctor. What’s going to go wrong? The kids go back and Steve (yes, his character had the same name which I found humorous) witnesses the doc getting killed by something. The fun continues as the blob goes through a mechanic (yes, they used to work late at night), the grocery store Steve’s dad owns, and finally into the movie theater where the other kids are watching a spooky movie. It’s hard to get a good handle on what time it is during the movie because Steve and Jane are at home and in bed and need to sneak out while other kids are at the movie. I got a little confused. They run away from the blob and Jane’s younger brother shows up, fires his cap gun at the blob, and hides in the diner where the owner is just shutting down for the evening. Yes, before the movie crowd gets out. Hmmm, strange time to shut down, but oh well. Steve, Jane, the younger brother, and the diner owner are all trapped inside the diner. They head to the basement for safety. There they discover the blob hates the cold. Steve yells upstairs (he’d been on the phone with the police) and tells them the good news. They collect up all the CO2 fire extinguishers in town and hold the beast at bay until the military can arrive and drag the thing off to the arctic where it’ll remain froze forever. As a Writer: I liked how the movie didn’t just jump in and BAM! Monster! BAM! Dead teenagers! BAM! Action! Instead if had kids doing what kids did in those days. Cruising, parking, going to the picture show, and talking with other kids. Parents were parents and kids listened. Well, kind of. Except for the sneaking out part. The police didn’t just write the kids off but did police stuff and came up inconclusive and based on the kids involved determined it was all a prank. Given the time the movie was shot there wasn’t any instant communication so they had to wait until morning to verify stories. Everything fit and made a sort of sense. It’s hard to pick anything apart on this movie. It was fairly tight (everything took place in an evening) and even though it’s all during the night, it’s hard to tell at what time of the evening it’s taking place. Recommendation: Overall this is a fun movie regardless of the time it was shot. Yes, it’s late 50s, but a lot of what happens it still easy to follow. It was made in a timeless fashion that hasn’t deteriorated much over the years. It’s a simple plot, but one that holds up. If you’ve never seen this movie, I’m sure you already know what happens and it’s still fun to watch it all unfold. If you saw this movie and think you remember it, watch it again. I had forgotten a lot of the events in the movie. Given today’s global warming trend I’m surprised a remake or sequel isn’t in the works. Seems like this would be a great fit for today’s movie goers. I’d go see it. Maybe I should write it! Hey, not there’s an idea! I watched the Hunger Games this weekend. This movie has met with much acclaim and greeted by excited fans everywhere. People have been so excited to see this book get made into a movie. I’m glad they were excited. It’s usually a good thing when fans get excited about a book being made into a movie. Even if I did have a couple of issues with the book, I wanted to see the movie as well. As a Viewer: I had recently read this book so I was excited to see how it translated to the big screen. There were several scenes in the book that I particularly though would look great on the big screen. They could do so many things. Sadly, my imagination is beyond what the filmmakers decided to run with. Some of the characters were far more over the top than they needed to be and others just didn’t live up to expectation. This isn’t a terrible thing, but for me it got the movie off to a bad start. A lot of the beginning of the book was chopped up into bites that didn’t fit well together. I didn’t have a good feeling about any of the characters. I think this is because in the book a lot of what Katniss feels is all internalized and not vocalized. So it didn’t surprise me much, just made the start of the movie choppy at best. Now that I think about it, the whole film was choppy and not fully explained well during the telling of the story. I can see where they’re setting up for a sequel with some added scenes that were not in the book (those with the president and behind the scenes with the filming of the Hunger Games show). Those to me were jarring as I know they weren’t in the book. But this is a movie. I enjoyed it for what it was: a poor translation of the book. As a Writer: This movie stunk on ice. Maybe my expectations are too high these days, but the Hunger Games was a short enough book they could have told a more cohesive story. They eliminated a large number of things that made Katniss tick as a character. From her sister’s cat to Peter proclaiming his love for her and her astonishment that it wasn’t just an act for him as well. There was a lot left out from the book that made this movie clunky. If you hadn’t read the book I could see several spots (key spots) where you’d not fully understand the story. So much of the back story of the characters was glossed over that their motivations were only vaguely understood. I also didn’t think it was as visually appealing as we could do in this day and age. From the effects to the costumes to the characters they missed the mark on several spots with this movie. Yes, I’m getting cynical in my old age, but with the special effects we have available to us they could have done better with this one. For me, this movie was a swing and a miss. Recommendation: Either don’t read the book and watch the movie or watch the movie and don’t read the book. This movie is a classic case of getting close, but missing both the mark and the point of the book. If you only watch the movie you’ll be confused about several key points .Perhaps if you watch the movie first then read the book you’ll like both. I’ve often found that when I read a book first the movie doesn’t live up to expectations. Overall I found the movie disappointing. Yes, yes. I was one of those detractors that said “It’s too early for a reboot.” I huffed, I puffed, and no one listened. Even though I liked the first two Spiderman movies, I really didn’t like the third and the more I thought about it the first two were okay at best. With the way they’ve gone with the more recent Marvel movies (Iron Man, Thor, Captain America) I was hopeful that the Spiderman reboot would follow in their footsteps and do more character development rather than plot development. I’ve seen too many movies that rush things for the sake of plot rather than let the story unfold in a way that makes more sense. As a Viewer: This movie takes its time unfolding. It’s not as slow as the start of Captain America, but it does take a good amount of time to build up the characters in the film and their relationships. We get some insight to Peter’s parents (something we haven’t seen much of even in the comics) and Flash Thompson is a big jerk that we’ve grown to know over the years. One of my favorite things is that we get Gwen Stacey. For those who’ve read the comics over the years, Gwen was Peter’s first true love (let’s not talk about Betty Brant). I was disappointed in the first Spiderman movies when they moved straight on to Mary Jane. So this was my first happy surprise. I wasn’t disappointed that they went, again, with the genetically modified spider. The original was radio active, but I got over that with the first movie. This one made far more sense and Peter’s being at Oscorp made more sense. Gwen working there was a little confusing, but it made enough sense that I didn’t mind. The movie took a good long time to get Peter into his spiderman costume and his hunt for Ben’s killer leading him down the path he went made more sense than the original comic where he found the guy and that was that. In fact this piece never gets resolved and I wonder if that will be revisited in later movies. I’m hopeful. Dr. Conners. The Lizard. There were some parallels between him and the Green Goblin in the first movie, but the Lizard was done so much better AND *MAJOR SPOILER* He isn’t killed. It always bothered me that in the super hero movies they felt the need to kill off the main villain. Only at the end do we get a glimpse of Norman Osbourne and throughout the movie we keep hearing how he’s close to death. This leads me to believe that we’ll be seeing more of him in the next movie. I’ve also heard rumblings that we’ll be getting a Venom movie in the future as well. I can only hope they stick with it this time and let things play out slower in the movies and build better. Based on how well things went with all the other Marvel movies and the build up to the Avengers, I think they’ve found a winning formula. As a Writer: This movie stunk on ice. Ok, I’m kidding. I had a blast watching this movie. As I’ve noted above they did a great time building up the characters and you actually cared when someone died. It wasn’t flash, bang, dead and you didn’t even know who died or why and it didn’t matter to the story much at all. In the reboot things take their time and with a tight plot and good characterization we get a movie that’s well laid out and leads you from a logical beginning to a mostly logical conclusion. Why can’t we get a regular movie like this instead of movies like Avatar and Prometheus? Recommendation: If you ever read a Spiderman comic as a kid this is the movie you’ve been waiting years for. This one finally got (in my mind) it right. Even if you haven’t read a spiderman comic in your life, this is still a good movie that will do the slow build up and then leave you on the edge of your seat waiting to see what’s going to happen next. No one is safe. Peter is a reckless teen and his actions, although well intended, don’t always have the desired outcome. That adds a little bit of reality to the movie and helps with the suspension of disbelief even when the life a street with cranes in a matter of minutes (the only thing that annoyed me about the movie). Go see it. You’ll enjoy it. I remember watching the first Alien movie and cringing in fear, being scared half to death, and wanting more and more and more. Aliens fueled that need for more in a different way. It was such a different movie, but I loved how it went in an entirely different direction. Still, it scared the pants off me with aliens that would stop at nothing to kill and reproduce. Aliens III I also enjoyed. Ripley’s sacrifice at the end almost had me in tears. Still this one scared me over and over. Aliens: Resurrection was a movie and that’s all I have to say about that. There are also two Alien Versus Predator movies out there. I liked both just because of the monster match-ups like we used to see in days of old (King King versus Godzilla, Frankenstein meets the Wolfman, and the like). To me it never added anything to the original films but it didn’t take away from them either. Now we have Prometheus. It’s almost a prequel to the Alien movie, but not quite. I’ll get to that later. Let’s review, shall we? As a Viewer: I love a big movie. Big set, big space ships, big aliens. This movie had a good build up and showed us a little of where man came from. Well, according to the film. I’m not sure on the historical references to the stars they showed and I’ve watched a lot of Ancient Aliens lately and I don’t recall any of these drawings. I’m thinking it’s all made up. But hey, what do I know? The movie jumps from discovery to a space ship traveling to a moon orbiting a gas giant. This struck me as odd. The planet was fine, but it would be cold a lot of the time hidden in the gas giants shadow and super hot when exposed directly to the sun. I got over that quickly and figured what the heck. Let’s go with it. Our crew (who we’re only lightly introduced to through dreams our good android David watches while they sleep) wake up when they’re near the planet. The effects were great! Loved the tiny little ship next to this massive planet. Put things into perspective. They cruise around a little (very little) and find a settlement. Well, some straight lines. I’m going to speed up here as I don’t want to explain the entire movie. Inside some massive domes they discover the ancient people who we’ll recognize from the first Alien movie with the weird trunks and massive rib cages. Turns out they were building a biological weapon to kill off the entire human race they created. This struck me as stupid. Tens of thousands of year ago they created humans and then created these ‘aliens’ to wipe out the human race? The only reason they didn’t is because what they created killed off the people on the planet. Oh, this is when they discover that even though there was this ‘map to the stars’ from the old cave paintings didn’t point to the creators’ home planet, it pointed to a place that thousands of years later they created this ‘alien’ to wipe out humanity? Am I the only one that caught this? This was the point as a viewer they lost me a little. Okay, more than a little. This pissed me off and I could go on an Avatar type rant about plot holes, but let’s continue. Mr. Weyland had been hiding on the ship the whole time and wanted to meet the creator and live longer. David was his lackey and that was no surprise. There is one ‘creator’ left and when they wake him up, he starts to kill everyone and prepares to launch the ship and take it to Earth and kill off all of humanity. Our fearless crew launches their ship into that ship and stops the end of our race. As a Writer: This thing had plot holes big enough to drive a truck through. It bothered me to no end. I was so hopeful that something, anything, might be explained in a logical sequence, but this one really stretched what could have been a great script. For me, stretched to the breaking point. The characterization was so light that all but one character was a cardboard cut out. Could have been anyone and you knew they were all fodder to be killed off. The one character they bothered to develop you know will survive just as Ripley survived as the end of Alien. There were a lot of inconsistent character traits on those one dimensional people and the actors didn’t seem like they wanted to be bothered to take it further. The aliens weren’t the same ones we came to love in Alien. There was no explanation of anything they found. We’re left to assume how it all worked. Or guess. And the ending isn’t where most expect it as you know they’re leaving this open for a sequel. Weak characters. Weak plot. Great special effects. Pretty much what Hollywood produces now days. As a writer nothing caught me by surprise. Noting built up any suspense. And I cared nothing for any of the characters. At least with Friday the 13th style movies you know everyone is going to die in an entertaining way. This one didn’t even bring that to the table. Recommendation: Alien was shot with a small budget and relied more on lighting and camera angles and you almost never saw the alien. This brought fear into your heart wondering what was going to happen next and you’d catch the slightest glimpse and HOLY CRAP! Prometheus brings in a lot of CGI effects, bigger monsters that don’t seem to relate to the original movie at all. The first movie made me jump, this one had me wondering why? Why did they make this movie so poorly? Why did they spend so much on special effects and so little on a cohesive plot that would bring the universe of Alien together? Why did they make a movie that works out as a throw away movie in a universe that needed some great answers to big questions? If you like Alien, Aliens and the other two, you need to see this movie, just don’t go in expecting to be scared. Yes there are a couple ‘stressful’ situations, but they felt forced. Almost like they needed some suspense and artificially created it. I was disappointed with the characters and the plot, but if you’ve got $10 burning a hole in your pocket, you can do a lot worse (like 2012). It’s not all bad, but it left me more frustrated than entertained. I wanted so much more from this movie that it just didn’t deliver. A lot of good and bad things have been said about this movie. What did I think? I think it all started with a chicken burrito. *Warning: Potential Spoilers. The movie starts us out with our main character getting into trouble trying to get a chicken burrito for a girl he’s trying to impress. Hijinx occurs and the bad brother is in trouble once again. His brother forces him to join the Navy or move out of the apartment they share. You can guess what happens. We also get to see some satellite dishes pointed to the stars and sending out a “Hello” to the nearest neighbors on a habitable planet. Ok. I’m fine with that. Obviously, because of the previews, they come down to say hello. There are a lot of fun scenes where the alien fires weapons that look like the battleship pegs and the stick into the ships and then ‘push’ down and explode. I got a good laugh out of them including that. I also got a good laugh out of them using the tsunami buoys to track where the aliens were. They didn’t show up on radar so this grid of buoys allowed them to ‘see’ where they were at. So they called out letter and number coordinates to track where they would fire. I also liked this clever inclusion that tied back to the game. No surprises in this movie. Just a fun, alien invasion movie like in the good old days. I enjoyed the nod to the retired Navy personnel as well as their being used to help fire up the old battleship and head out to fight the aliens. If you’ve never been on a battleship, they’re HUGE! Big old gun. Heavy plating. Everything is analog on those suckers. They’re fun ships. As a writer: Let’s get this out of the way first. Bad boy turns his life around to save the world. Very tired trope. Been done a million times. I’m just glad they didn’t go on and on about his past and what he needed to do to redeem himself. It wasn’t needed, but added a little humor to the film. If it weren’t for that, none of the characters in the movie would have any dimension at all. They’re all pretty much interchangeable with any of a thousand other characters. Many are there for cannon fodder and when you’re talking about an alien invasion movie, that’s to be expected. The plot, what there was of it, was pretty tight. No real loose ends. The character development isn’t so much that our main hero needs to change as much as he doesn’t really have a choice. He’s forced into a situation, saves the world, and is right back to being himself. At least as best as we can tell at the end of the movie. Nothing special to see here. It’ a movie to entertain. Little else. Recommendation: This isn’t a movie that will change your life. It’s going to give you a couple of laughs, some good eye candy with great special effects, and a half-way decent story. Unlike many movies I’ve seen that have no real plot at all, this one does a pretty good job. 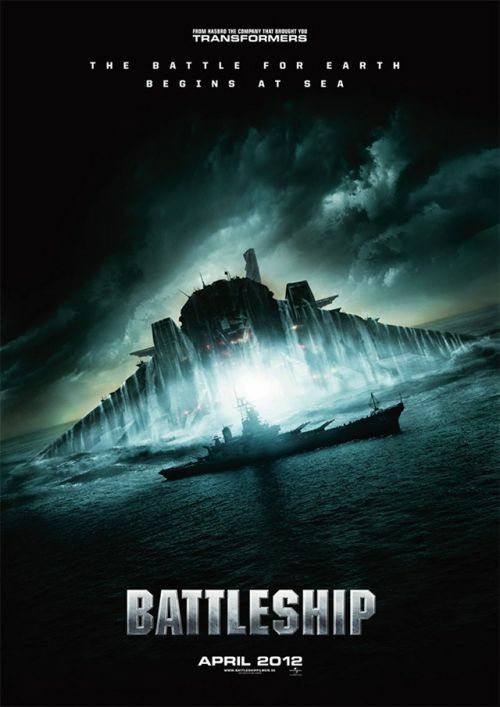 If’ you’ve got $10 burning a hole in your pocket and are tired of seeing the Avengers for the 37th time this week, take a break and check out Battleship. Go in with the expectation that it’s not going to blow your socks off, and you’ll enjoy it. As a kid I read comic books. I preferred Marvel over DC comics mainly because the Marvel comics usually had something funny in them. It didn’t matter which title you picked up you could usually find a little joke, witty line, or funny incident. I liked that about Marvel. Over the past week building up to the Avengers movie I re-watched all the movies building up to the Avengers movie. I love living in an age when the comics I read as a kid can come to the big screen as movies I love to see and actually get excited to go and see. Marvel Studios had done an incredible with the movies they’ve been putting out lately. Why? If you’ve been paying attention to the movies, they’ve all been tied together with little snippets after the credits. This has normally been done to signify a sequel, or even to show bloopers. But with the Marvel movies, they’ve done this to build up to the Avengers movie. All those little snippets have given us a very small glimpse of something bigger. I’ve been paying attention and eagerly awaited this movie. As a viewer: Having recently seen all the build up movies I was primed and ready to watch this movie. Or so I thought. The movie started out a little slow but built quickly. We are re-introduced to each of the characters so it’s not critical that you’ve seen each of the previous movies, but it will help for full enjoyment of the film to get a lot of inside jokes, cross pollination of characters, and to realized who many of the minor characters are and how they fit into the bigger picture. Once the action gets going there is so much going on that it’s easy to see why many people are seeing this movie more than once. I know I need to see if again as I keep reading other reviews and have many “Oh yeah!” moments as I recall what that put as their favorite moments. If you’re a fan of the comics or a fan of the movies (or like me and a fan of both) you will love this movie. This is what comic movies have been missing for years. These heroes all live in the same universe and for them not to interact has been an issue with me. Granted I don’t want to see too much going on as with what happened with the Batman franchise where they had too many characters to form a coherent storyline, but the way Marvel has given each hero their own full movie to introduce the character’s story so they can be used in a bigger picture was nothing short of brilliant. The movie made me think, made me laugh, almost made me cry. Overall I found myself in awe with what they created over the years to build to this one(?) movie. I have the ? There because of the 1st of two after credits that reveal that we’ll likely be getting a sequel. As a writer: This movie did so many things right. I will have a minor spoiler in here, so skip if you have not see the movie. The movie had a wonderful blend of humor and action. Much of the humor was in the form of one-liners that if you’ve seen the previous movies were hilarious, and if you hadn’t seen the previous movies were still funny. Non of them came off as corny or forced humor and worked well with the characters that said them. The dialog, for the most port, didn’t feel forced. There was one scene, and I’ll get to that, but with a movie this long, it didn’t deter from my enjoyment. The one scene was in the middle. The group, all big egos and a number of hot-heads all have an argument. They kept trying to excuse Bruce Banner so he didn’t turn into the Hulk. He kept saying “No, I’ve got this under control. I have a secret.” He said something to this effect a couple of times. There was even a discussion about helping him control the beast. After the argument the S.H.I.E.L.D. Ship is attacked and Bruce and Natasha (The Black Widow) are tossed into a lower deck. Bruce turns into the Hulk even though he seems to be fighting the transformation. Later in the movie, Bruce is dropped off and told to “suit up” and they all look at him. He explains his secret and immediately transforms into the Hulk demonstrating that he has full control of his ability to change. I kept thinking back to the scene where he changed in the middle of the movie and couldn’t figure out why, if he had this level of control, it was an issue at that time. He became the unthinking, out of control beast where in the end of the movie he seemed to be mostly in control (and had the best physical comedy bit in the entire movie when he punched Thor). Color me confused, but this was the only scene in the movie that bothered me. Perhaps when I watch the movie again (and I will watch it again) I’ll be able to figure it out. Recommendation: Watch all the other movies that build up to this movie. I’m sure there’s a list out there of all the Marvel movies. This will help to increase your enjoyment of the movie as you see the characters that were introduced in one film show up again in the Avengers. I’m not talking about Thor, the Hulk, etc. I’m talking about a lot of the minor characters. There are also a lot of inside jokes that are made funnier. Even if you don’t see the lead up movies, do see the Avengers. It set the standard for what a comic book movie can be. It set the standard for a summer block buster. It set the standard for what a good movie with a lot of CGI can be. It’s got plot, characterization, it’s got dialog, it’s got humor. It’s just a fun movie. Do see it. You will enjoy it.